Doctors experience a strange conflict throughout their working lives. On the one hand, we are trained to save lives and alleviate suffering. On the other, medicine is incredibly conservative – slow to change and wary of ideas that challenge the status quo. Indeed, there is an estimated average time lag of 17 years for a new treatment or research evidence to reach clinical practice. The reasons for this are long and complex: to do with processes and policy but also, in no small part, a reluctance by doctors to change their current practice. Why should this be the case? If a treatment or procedure has been suggested to be of benefit, why not try it, especially as it might offer new hope to patients? The argument for this is particularly strong in the case of cancer treatment. The reality is that doctors’ reluctance to go “off piste” when conventional treatment has failed is often due to their concern over being sued. Once doctors deviate from standard practice, they open themselves up to litigation. Indeed, the Bolam test – currently used to assess medical negligence – involves assessing what the average doctor would accept as standard procedure. This inhibits innovation, it is argued, and Maurice Saatchi, the former advertising guru, is seeking to change this with his Medical Innovation Bill. Its origins lie in Lord Saatchi’s devastation as he watched his wife, the novelist Josephine Hart, die of ovarian cancer in 2011. He has managed to turn his loss into something that has the potential to bring untold benefit to future sufferers. It is a tragic indictment of modern medicine that innovation is too often jettisoned in favour of the status quo for fear of legal action. Defensive medicine is at the heart of so much clinical practice today, but the Bill – if accepted into law – would deftly excise this, leading the way for doctors to feel free to strive for medical advancement. This doesn’t mean that doctors would have free rein to experiment on a patient – they would still be bound by professional guidance and their duty of care would remain to their patient. Nor would it mean that the Bill would become a substitute for proper clinical trials. But what it does mean is that, in cases where the evidence is shaky, wanting or not yet clear, the Bill would set out a code by which doctors could try alternatives. It would provide a legal framework by which doctors, in discussion with their patients, could try off-label drugs or a device, treatment or intervention that might have some clinical data supporting it, but has yet to be fully proven. Initially, the Department of Health was sceptical, but since the Bill was launched it has gained considerable public, medical and legal support. Then, in November last year, Jeremy Hunt, the Health Secretary, gave it his backing, saying that “we must create a climate where clinical pioneers have the freedom to make breakthroughs in treatment”, and commending Lord Saatchi as “a great example of a parliamentarian motivated by conscience”. A public consultation is now planned, beginning later this month. This is tremendously exciting: the history of medicine is littered with innovators who flew in the face of received wisdom and dared to challenge orthodoxy. 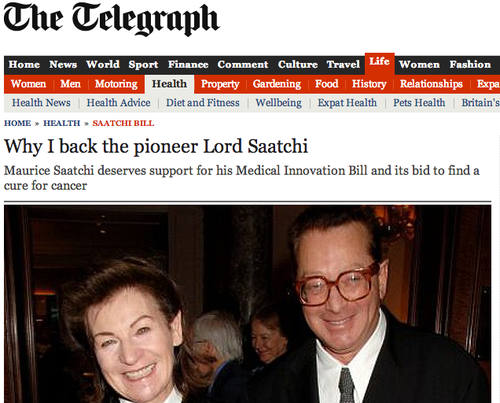 If the Bill passes, it may well be that in years to come Maurice Saatchi will join their ranks, and will no longer be known as an advertising guru, but the man who helped doctors find a cure for cancer – and saved an untold number of lives.